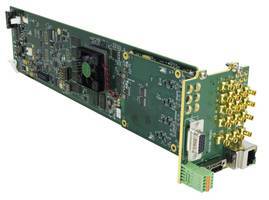 The 9904-UDX-4K up/down/cross Converter and Image Processor offers accurate SDR-to-HDR and HDR-to-SDR conversion. The processor with SL-HDR technology generates a single layer video stream to distribute SDR with dynamic metadata. The product allows production truck operators for creating SDR signals from HDR sources such as cameras, servers and graphics systems. The processor eliminates the need for sport productions for using SDR and HDR cameras and processing path.